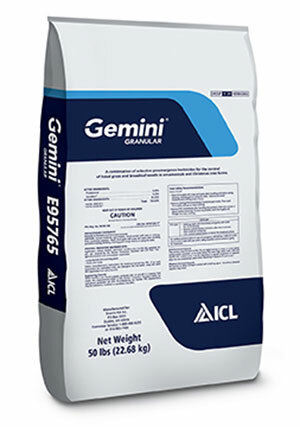 ICL Specialty Fertilizers released the Gemini Granular preemergent herbicide, which features ICL’s R-50 Optimizer. When traditional granular herbicides are applied and watered in, only a portion of their active ingredients comes off each granule, or carrier, according to ICL. The R-50 Optimizer in Gemini Granular is designed to move more of the herbicide’s active ingredients off of the carrier and spread them out further, providing a wider and more effective protective barrier. Gemini Granular with R-50 Optimizer controls more than 120 grassy and broadleaf weeds for up to four months. The preemergent herbicide has a low risk of phytotoxicity with more than 450 tolerant ornamental species. 2 Comments on "ICL releases preemergent herbicide with optimizer"
Is this product safety use on centipede is always your grasses. Also is it available in liquid form? Gemini Granular is not labeled for use on Turfgrasses at this time, but that may change in the future. R-50 Optimizer is only part of the Gemini Granular formulation because it’s role is to help move the active ingredients off of the granules. Gemini 3.7SC is the liquid formulation and it is labeled for Turfgrasses, including Centipede and Zoysiagrass. You can download a specimen label at our website: https://icl-sf.com/us-en/. Gemini 3.7SC is available in 1/2 gallon and 2.5 gallon containers.